Firestone Walker Brewmaster Matt Brynildson is at the forefront of the commercial side of blending beer, blending everything from the signature limited-release anniversary bottles to their widely released six-pack beer DBA. In late summer, just before the fall harvest season, a panel of winemakers from California’s Central Coast region convenes at Firestone Walker Brewing Co. in Paso Robles for an epic blending session. It’s a coveted gig that brings together some of the most educated palates in the business to help sort through dozens of barrel-aged beers from Firestone Walker’s cellar and settle on an ideal blend for its annual anniversary release. The dozen winemakers are split into teams of two, given pencil and paper, tasting glasses, and 100-milliliter graduated cylinders, then set loose with samples of a multitude of barrel-aged, high-gravity beers that span a gamut of styles—from all manner of stouts and barleywines to brown ales, pale ales, India Pale Ales, and anything else that the brewery has stashed away in its cellar. Before long, the tasting tables are littered with plastic cups as the winemakers pour, swirl, and sip their way through the beers—isolating elements in each and blending toward a finished flavor profile that, ideally, is synergistically greater than the sum of its parts. Once each team lands on its ideal blend, Firestone Walker’s brewers mix together larger batches of each and set out flights for a blind tasting. The panelists taste each beer, vote on their favorites, and the winning blend is scaled up—a process that often involves at least seven different beers and hundreds of barrels—packaged and released as that year’s anniversary ale. The resulting over-the-top, ultra-complex brew is an extreme example of how brewers can blend beers to craft a flavor profile that can’t be replicated in any single batch. Firestone Walker also employs blending in many of its production beers, including its flagship Double Barrel Ale. The wort begins fermentation in stainless steel and then the batch is split into two strands—one that ferments out in stainless steel and one that ferments in oak barrels—that are then blended back together. “I think sometimes we get blinders on as brewers and we’re really batch-oriented, but winemakers think quite differently,” says Firestone Walker Brewmaster Matt Brynildson. “Winemakers look at their entire toolbox, which is all of their barrels, and taste through them to cull the very best components that, when blended together, result in flavors and a complexity that can’t necessarily be created in a single lot. Keep up with the latest trends in craft beer and homebrewing with a subscription to_ Craft Beer & Brewing Magazine®. _Subscribe today! “The longer you brew and the more comfortable you get with your materials and your brewing process, the more you realize that there’s so much variation in raw materials, and there can be a fair amount of variation from fermentation to fermentation with yeast performance, so blending is a tool not only to enhance flavors but also to create consistency in your program,” he continues. Brewers have long employed blending in making beer. Lambic and gueuze are two historic styles made by blending together batches of older, barrel-aged beer with new beer. Popular beer lore holds that the porter style is derived from a “three-threads” mix blended at the point of sale by a London barkeep. According to _The Oxford Companion to Beer, _Eugene Rodenbach studied porter-making in England and returned to his family’s brewery in West Flanders, Belgium, with ideas about wood-aging and blending. Rodenbach Grand Cru, a Flanders Red Ale made from blending a soured, barrel-aged beer with new beer, is a classic example of the alchemy that can be achieved by blending. 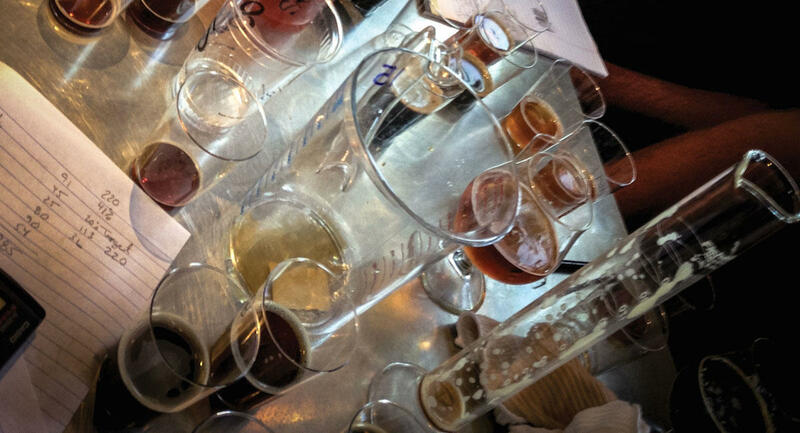 Taste is subjective, of course, and trying to create an exact science around blending beer is a futile exercise. It all comes down to individuality, experimentation, and what works in the moment. No special equipment is required, except for your taste buds and some way to measure the beer and keep track of what you did, and the results can be a pleasing one-off project or something that you try to replicate again and again.